A comprehensive collaboration to develop media for constituent outreach and fundraising with an extraordinary organization "dedicated to creating a world free of domestic violence and relationship abuse." Facilitated a logo redesign process which included surveys for key stakeholders and interviews with all staff. 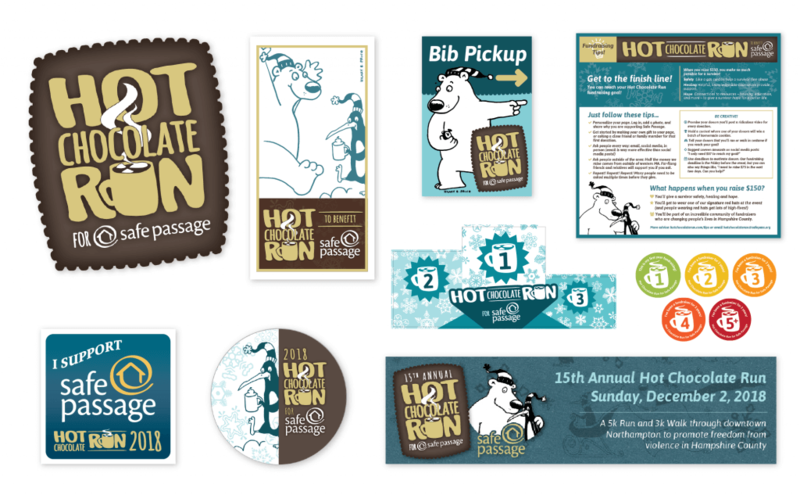 Revised visual identity and ongoing management of promotional and logistic media for Safe Passage's Hot Chocolate Run fundraiser. Conducted a robust rebuild to improve visitor experience and site performance. 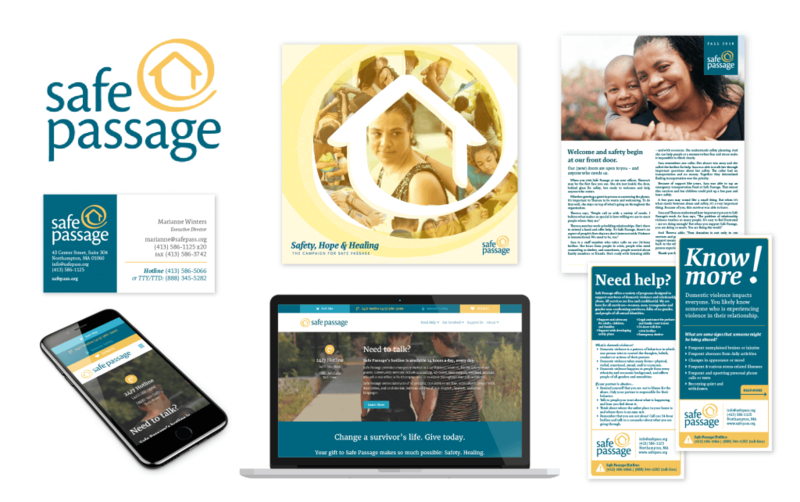 Design support for a wide array of print and digital outreach efforts including newsletters, fundraising campaigns, and client services. Safe Passage was interested in creating a more practical and contemporary identity to better reflect their expanded sense of self, while honoring the continuity of their work. 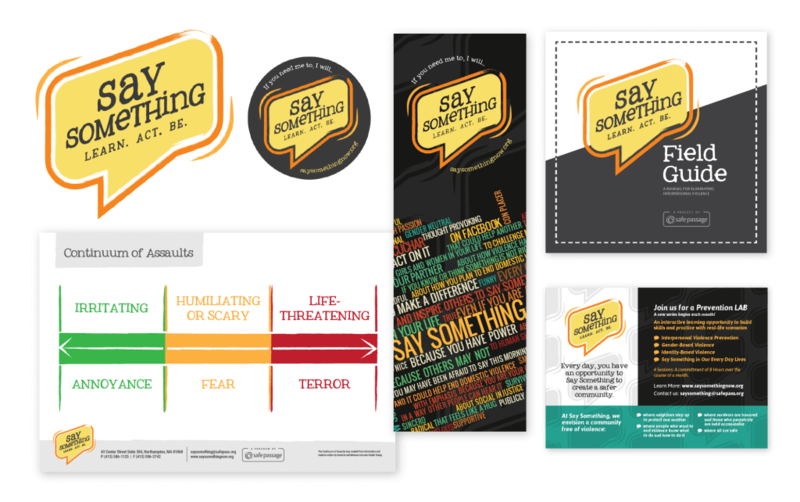 Their previous logo, centered on the image of a house, had been developed during a period in which it was crucial (and advantageous) for them to communicate their role as a physical shelter for domestic violence victims. The literal depiction of a house had come to feel too limiting and perhaps insensitive to the various forms that "home" can take for people of different socio-economic backgrounds and life experiences. Practically-speaking, the logo itself was an awkward shape. 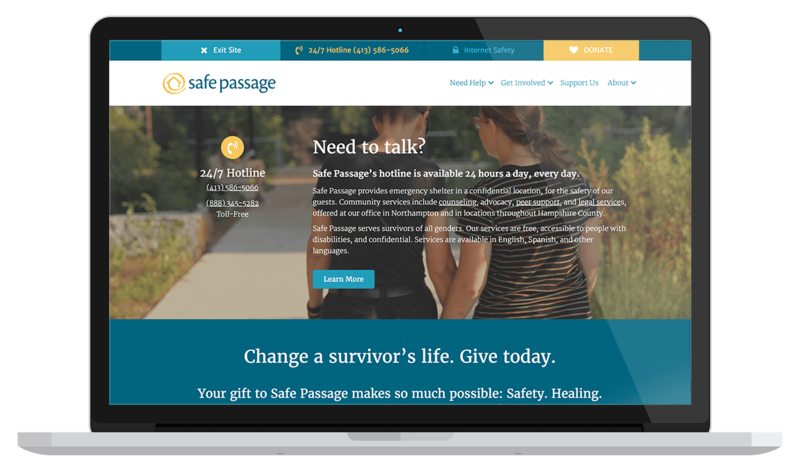 I had been working with Safe Passage for some time before engaging in the logo redesign process, and it's "L" shape was less than ideal for a variety of applications, and did not adapt well to the now-ubiquitous square of social media profiles. Safe Passage has a passionate and dedicated staff working in multiple sectors (their shelter, legal and counseling services, community outreach, etc.) who operate through consensus, so it was necessary to engage a large number of participants in the identity development process. A survey was distributed to staff, board, and volunteers to gain a clearer sense of the Safe Passage brand and the substance of its work. These findings were further informed by conversations with a broad cross-section of the organization's leadership. Multiple rounds of refinements culminated in a final presentation to this committee where the merits of each design option was deliberated and a referral was shared with the directors. This format allowed for a large number of people to participate while still being reasonably efficient and reserving some authority for the leadership. The redesigned logo and identity system represents a modest departure through a more profound expression of the underlying concept of "home". After considering alternatives to the image of a house, this new composition – which places a more stylized suggestion of a house at the center of a spiral – managed to elevate the concept of home to more of a feeling rather than just a place. This new mark is perceived as expressing the layered and complex role of Safe Passage in moving people both towards and away from "home" depending on the nature of that person's relationship with it at a given moment. Functionally, this new mark was developed with a modern notion of modularity in mind, providing for multiple compositions to fit a variety of frames, including those pesky digital squares. The color palette and typography is conservative, warm, and inviting, and retains much of the character of the previous mark. The awkward "L" shape of the type is resolved by placing the mark in the open space, or through the use of a horizontal format with a single line of type.